The Comedy Central show's latest episode focuses on balancing personal and global tragedies, and it's one of its best yet. Naming an episode of a comedy TV show “The Tragedy” is a big risk in itself. Doing it without serving that episode with a massive dose of sarcasm is another challenge entirely. Then again, after two seasons of their Comedy Central show, the team behind “Corporate” has had plenty of practice. This week’s episode is a succinct expression of something that many Americans face on a daily basis: With so much trauma happening on a worldwide scale, how do you respond? “If you are on the internet or alive right now, it’s all just constant tragedies and it’s a nightmare. This has been going on most likely since the dawn of civilization, but now you’re just more aware of it than ever,” series writer and co-star Jake Weisman said in a recent interview with IndieWire. So how do you turn that into comedy? In “The Tragedy” — written by Bridger Winegar and directed by series co-creator Pat Bishop — one unspecified national tragedy permeates an otherwise-normal day at megaconglomerate Hampton DeVille. The outside event leads to an escalating battle of social media tributes, as each employee tries to write the most sincere-seeming expression of sympathy toward the victims. Ingebretson and Weisman’s characters, Matt and Jake, each approach the situation in their own particular way. (Matt’s rousing Facebook post closes with a call to “fight fire with peace fire.”) HR rep Grace (Aparna Nancherla) tries to subdue the fact that “the tragedy” is overshadowing her birthday. 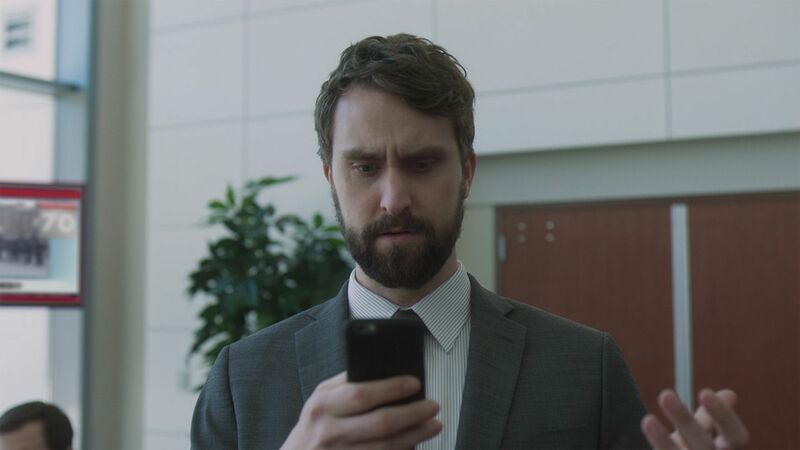 While the episode is focused on people’s reactions to tragic events rather than the causes, the “Corporate” team still wanted to avoid labeling any specific kind of tragedy. “I think we just wanted to talk about how confused we feel about living right now in this time where every day you wake up to a new fresh hell and you’re just like, ‘I guess I’ll get in my car and put on the Beatles on the way to work! '” star Matt Ingebretson said. “Corporate” has been able to tap into the anxieties of workplace life, but “The Tragedy” shows how best this series can handle the ways that so many people — whether they work in a cubicle or not — have to subdue their own concerns about the state of the world in order to get their literal job done. Most of Season 2 has been strengthening observations about being pulled further inward and being forced to confront what is happening so far outside the office walls. “Thankfully, we’re able to do both those things in our show. We can talk about corporate America and also that you’re hungry and there’s no snacks in the kitchen. Those two things next to each other is what our show is,” Ingebretson added. But part of the risk of the episode is that “The Tragedy” becomes too relevant. As shows or episodes often get postponed to avoid real-world parallels, Weisman and Ingebretson knew that the emphasis had to be on the reactions of Matt, Jake, and their co-workers and the truth they find in their own helplessness. It’s an episode delivered with the same kind of specificity and tonal control that let “Corporate” cap off its impressive debut season with a “Remember Day” finale that found plenty of jokes from another unlikely source: 9/11. “I think we’re trying to not punch up or down, but just punch ourselves right in the face,” Ingebretson said. And despite the universal nature of the show sometimes, “Corporate” is ultimately rooted in trying to bring some humor into desperate situations. “Corporate” airs Tuesday nights at 10:30 p.m. on Comedy Central.